Croydecycle produces writing and images related to Croyde and/or cycling or walking in the South-West. North Devon has some of the finest cycling in the country. The Tarka Trail by Braunton is hard to beat and there is a network of quiet back roads behind Saunton Sands and over the hills inland. The area also offers a great variety of coastal walks, often with spectacular views. Village pubs and shops provide a welcome break. Forget the car, breathe quality air, feel the glow of exercise – it was you and you alone that got you from A to B. Enjoy! 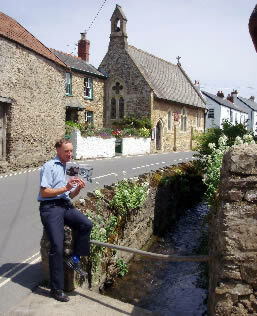 Croydecycle is run by Mike Harrison from his home at Rose Cottage. He believes that in most cases it is the bike that is the best way to get around North Devon. Croydecycle began in June 2005, since when there has been a flow of information of use to cyclists and walkers, whether local travellers or visitors. Walking maps at 1:12,500 – Sixteen maps cover the North Devon Coast and Exmoor (Watchet to Bude), nine maps cover South Hams coast (Plymouth to Brixham) and fourteen maps cover East Devon/Dorset coast (Exeter to Studland). In some places there are additional choices such as Lynton & Lynmouth with surroundings either east or west. For long distance path walkers there are two Coast Path maps covering Minehead to Westward Ho! The coast is covered in strips with detail taken from the main maps but shrunk to 1:15,000. Cycle maps – Braunton/Ilfracombe 1:30,000; Exmouth/Sidmouth 1:30,000; Totnes/Dartmouth 1:30,000; Kingsbridge 1:30,000. Devon Coast to Coast Cycle Route 27 at 1:60,000. At appropriate scales with comments on cycle possibilities and information. South West at 1:100,000 – maps for cyclists or drivers. The six maps are: Cornwall west; Cornwall east; North Devon; South Devon; East Devon/Exeter; Exmoor/Taunton. Maps show roads, places, relief, facilities – pretty much everything a road cyclist would hope to find on a map at possibly the ideal scale.